Unlike many major cities, London has a fully integrated transport system which is run by Transport for London (TfL ) and includes the London Underground ( Tube ), buses, rail, tram, river services, taxis, cycling and major roads throughout the capital. This book is part of TfL’s Transported by Design celebrations especially relating to the exhibition named ‘designology’ at the London Transport Museum which takes place throughout 2016. The Design icons in the book have been voted upon by Londoners to produce a top 10 in a collection that is curated by experts at the London Transport Museum and showcases London’s 100 greatest transport design icons from the past 150 years. Each entry in the book includes a quote from a member of the public who nominated the icon, information from a curator about the design and details where the icon can be seen. The initial top ten present many of the most famous icons including the black cabs, Harry Beck’s tube map, the Roundel, the Routemaster bus, the RT type bus from the 1930s and the modern S stock trains on the underground. The work of legendary designer Frank Pick is celebrated by many people, however the inclusion of the Baker Street Station Platforms, the Labyrinth artwork and Westminster Station in the top ten may surprise a few readers. Many of the designs are so familiar to Londoners that they can be often hidden in plain sight, TfL’s exclusive Johnston font illustrates how a simple design introduced in 1916 has been adapted for use for over a century. A number of the entries provide evidence of the remarkable number of innovations that been introduced in the network over the last 150 years. The distinctive Moquette fabric used all over the system was first introduced in the 1920s, Oyster cards arrived in 2003, the Legible London Wayfinding system has been helping lost Londoners and visitors since 2007, the Docklands Light Railway open in 1987, Pedestrian Countdown at Traffic Lights began in 2011, Cycle Hire Bikes were introduced in 2010 and the Emirates Air Line cable car took flight in 2012. Eye-catching posters have often decorated the walls of tube stations, the book includes the jazzy Brightest London poster of 1924, the surreal Man Ray poster of 1938 and the artistic Tate gallery by Tube poster of 1987. Art both inside and outside underground stations have for decades have been a feature of the system, Sir Eduardo Paolozzi’s mosaics at Tottenham Court Road, the Charing Cross murals by David Gentleman, the Leslie Green tiles from 1906, the East Finchley Archer and the Wrapper artwork at Edgware Road all make it into the top 100 icons. The rest of the entries are a mix of interesting station buildings, different types of vehicles, signage and equipment. Perhaps some of the bizarre entries are the regulator dials at Broadway, the lift grilles at Mornington Crescent Station, the Routemaster Window winder of 1954 and Wilfred the Rabbit which was perched on the radiator cap of some buses in 1922. Although many Londoners have a love/hate relationship with the transport system depending if it is working or not, this book illustrates why both Londoners and visitors are fascinated by the system. 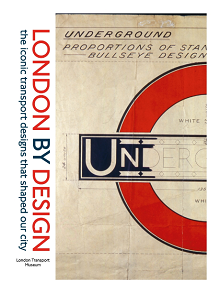 London by Design takes a closer look at many of the iconic designs from London Transport using stunning images, drawings, artwork and photography from the London Transport Museum’s archive to tell some of the remarkable stories behind their creation. This attractive and entertaining book will appeal to a wide range of people with an interest in transport, design, art or architecture. Spotting many of the wide range of design icons will also provide plenty of entertainment for both Londoners and visitors as they travel around London’s extensive transport system. By londonvisitors2014 in London Book Review - Non Fiction on June 23, 2016 .